Flexibility, Quality and Convenience are the hallmarks of piano lessons at KeyNotes Piano Studio. While studying at a large, commercial studio may seem advantageous, it is not always necessarily so. Large studios are often noisy and crowded, and offer very little individualized attention. Their focus is sometimes quantity vs. quality. The home environment can offer many distractions: phones, siblings, televisions, but students who have their lessons in such an environment learn to ignore distractions– strength they will need for performing–as well as to make their “piano time” a time to disconnect from the noise. In fact, we all live in a noise-filled world. Learning to tune inward and not respond to unnecessary distractions builds focus. In addition, student lessons in the home allow for the student to gain a sense of respect both for study time and for practice time. Siblings and parents learn to give the student space to focus, because the student grows in independence as he or she learns to ask for that space. It can foster respect among siblings as well as encourage siblings in their own pursuits. Working at home allows the student to receive instruction on his or her own instrument. The instructor is also able to periodically evaluate the condition of the instrument, and to refer a qualified piano technician in order to tune and regulate the piano as soon as it is necessary. Contact with others is a key part of understanding oneself as a musician. 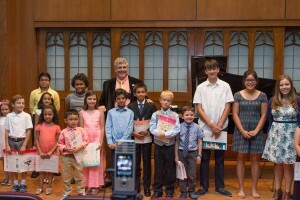 Students at KeyNotes Piano Studio have the opportunity to see each other perform and form musical bonds through recitals and other performance opportunities. It is here that they can get a gauge of themselves as part of a musical community, rather than having fleeting meetings with students who happen to study at the same time they do.